Nuclear physicist Enrico Fermi coined the term "neutrino", pioneered the creation of artificially radioactive isotopes through neutron bombardment, and developed the theory of beta decay, which forms the underpinning of the modern understanding of the weak interaction force. He is best known for conducting the first intentional atomic chain reaction, in 1942. He was born in Rome, and earned his doctorate at the University of Pisa. He briefly studied under Max Born at the University of Göttingen. In 1926 he explained the statistical laws (now known as the "Fermi statistics") which govern the behavior of particles now called fermions. He was awarded the Nobel Prize in Physics in 1938, and used the occasion of the gala ceremony to bring his family out of increasingly fascist Italy. By the next year he had settled in America, where he studied and taught at Columbia University and, later, the University of Chicago. In his experiments in the early 1930s he thought he had discovered the first transuranic element, but in reality he had unknowingly split the atom. He worked with Leo Szilard at both Columbia and Chicago and on 2 December 1942, under the grandstands of Chicago's Stagg Field, they completed the first controlled nuclear reaction. 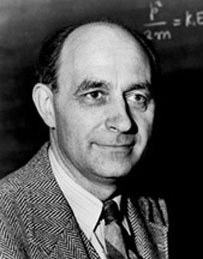 Fermi was one of the key scientists working on the Manhattan Project, the super-secret team that developed the atomic bomb during World War II. He also formulated what is now called the Fermi Paradox (sometimes phrased as "Why are we alone? "), which notes the seeming contradiction between the conclusion of most scientists that there is a high probability of extraterrestrial life, and the absence of evidence that extraterrestrials have ever visited Earth. He died of cancer in his early 50s, brought on years of heavy exposure to radiation before the danger was fully understood. In 1966, eight years after his death, the National Accelerator Laboratory opened near Fermi's lab at the University of Chicago. In 1974 the facility was renamed the Fermi National Accelerator Laboratory (more commonly called FermiLab) in his honor. He is also the namesake of a synthetic element created in 1952, fermium (Fm). Baptized as a Catholic (as were his siblings) in deference to his grandparents. Fermi himself was not particularly religious, and might be considered agnostic. His wife, Laura Capon, was Jewish. Upon the passage of racial laws on 9 November 1938 (including deprivation of citizenship), Fermi and his wife took a "vacation" to the United States with no intention of returning. See Emilio Segre, Enrico Fermi: Physicist (1995), page 5.